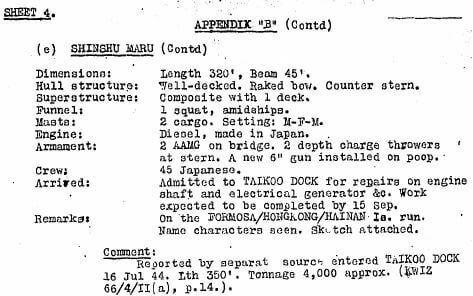 This suggests the ship an “IJA Landing Craft Depot Ship was between 4 Aug and 23 Sept 1944 was at Ujina, Hiroshima undergoing repairs to her rudder and steering gear and therefore was not in HK on 26 Aug 1944. This report correctly identifies the 1933 built 4182 gross ton Shinshu Maru. The ship was built as a cargo ship but converted to an oil tanker in 1943 (because of a shortage of tankers) and was sunk as such 13 October 1944 after being torpedoed by USS Bergall in 11.53N 109.17E.